HO Freight Set of 132 pieces contains: 20 beverage cases, 40 metal boxes, 12 wood spools, 12 wood crates, 10 wood barrels, 12 metal drums, 20 large sacks and 6 pallets. 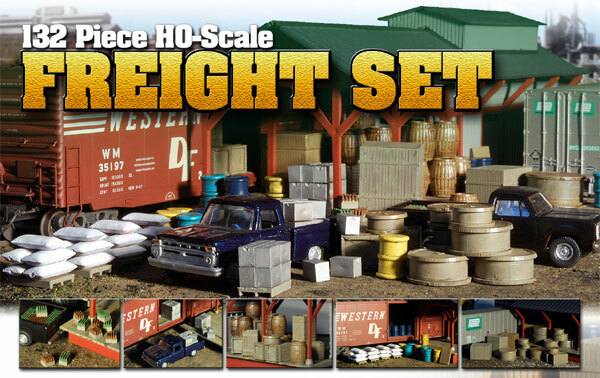 This set is comprised of plastic parts molded in two pieces for most of the freight items. Instructions: Simply remove from the spru and glue pieces together. In the case of the "crates", they are molded in 6 pieces. Glue the sides together and then finish with the top and bottom of the crate.